GR isn’t all that terribly far from Gunslingers, the main difference being that Raimo plays all the instruments. The LP opens with the steady rocking Low-Born, surrounded by an atmospheric drone feel. Some of the bass riffs on Vapours Invisible remind me of Pink Floyd’s One Of These Days, but the guitar is manically acid-damaged, and the rhythmic pulse weirdly off-kilter, making for a cool and twisted combination. 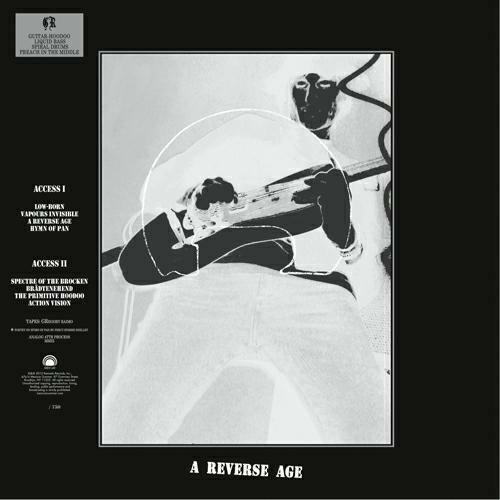 The title track features nearly 9 minutes of jamming acid-drenched psychedelic punk. Hymn Of Pan is a bit different, being an acoustic song that’s like a combination of traditional Celtic and Wyrd-Folk, though with Raimo’s unique vocals throwing the odd curveball. The promo sheet references The Magic Band and while the music overall isn’t like them I’d say the guitar on the all too brief Spectre Of The Brocken definitely has an artfully twisted Beefheartian spirit to it, though more psychedelic than Blues based. The guitar is more distinctly Bluesy Beefheart sounding on The Primitive Hoodoo, though it’s far more hyper-kinetic and has a chunky intense rockin’ groove too. Bradtenehend has a pounding bass riff that brings to mind Hawkwind’s Brainstorm and includes one of the most searing acid-fucked guitar freakouts of the set. And Action Vision is like a psychedelic version of MX-80 Sound’s brand of prog-punk. In summary, this is a powerhouse set that will make you break a sweat. Raimo is a good drummer too, seriously amping up the energy level. Another difference from Gunslingers is that while on those albums I question whether Raimo’s vocals included any real lyrics (and who cares, I like his style), I could actually make out words at times on this album. Note that the LP comes in a numbered edition of 750 and includes a download code.